Brian Knep here. I'll be showing a new piece, Drift Wall, at U. Mass Lowell and a new body of work at Judi Rotenberg during Boston Cyberarts 2007. The piece in Lowell is a larger version of Drift Grid. I want to see what happens when an entire wall is bubbling upwards, reacting subtly to viewers' presence or gazes. I recently recreated Drift Grid at Ron Feldman Fine Arts in New York, making it larger than I had before. The effect is beautiful. Standing in front of the piece, it fills your vision and feels more persent, alive, even intimidating. At Rotenberg I will be showing work in progress from my artist-residency at Harvard Medical School. I've been filming frogs, worms and other small organisms, manipulating the video, and creating pieces about change and again. It's been slow going. I'm hoping to get a few finished pieces done by Cyberarts and show some other work in beginning stages. You can read more about it in my journal. Oh, and I had eggs for lunch today. 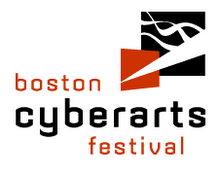 Welcome to the Boston Cyberarts Festival blog. The biennial Boston Cyberarts Festival has become an eagerly anticipated part of the Boston-area arts and technology scene since the first one took place in 1999. The Festival is the largest collaboration of arts organizations in New England and the only new media Festival in the world that encompasses all art forms, including both visual and performing arts, film, video, electronic literature, and public art. The concept behind this blog is to give some insight as to the artistic and technological genius that goes into developing the exhibitions and performances that make up this year’s Festival. We will be asking some of the finest artists participating in 2007 to write descriptions of their creative process, what the outcome will look like and even some preview video and sound files. The Festival celebrates the rich history of art and technology in New England, while providing a forum for the international cyberart community to come together and glimpse the future.